Here’s a picture of good old smokey,,,,I have a N63TU 2014 650 with the check engine light on,,,,,check faults memory,,,,,found 2 faults both on bank 2,,,,,lean mixture bank 2,,,,,and O2 sensor after catalytic converter lean mixture slow to respond ,,,,performed test plan for lean mixture and it said problem is the O2 sensor,,,,but me knowing better the O2 sensor could be one of the problems,,,,,but there could be another problem causing the problem,,,,,so to be sure,,,,I decided to smoke test the intake system on bank 2,,,,and look what I found a intake leak,,,,the plastic intake running that goes into the turbo is leaking pretty bad,,,,,,they do leak a little because it’s not a great set up and never seals 100%,,,,,but it shouldn’t be this bad. 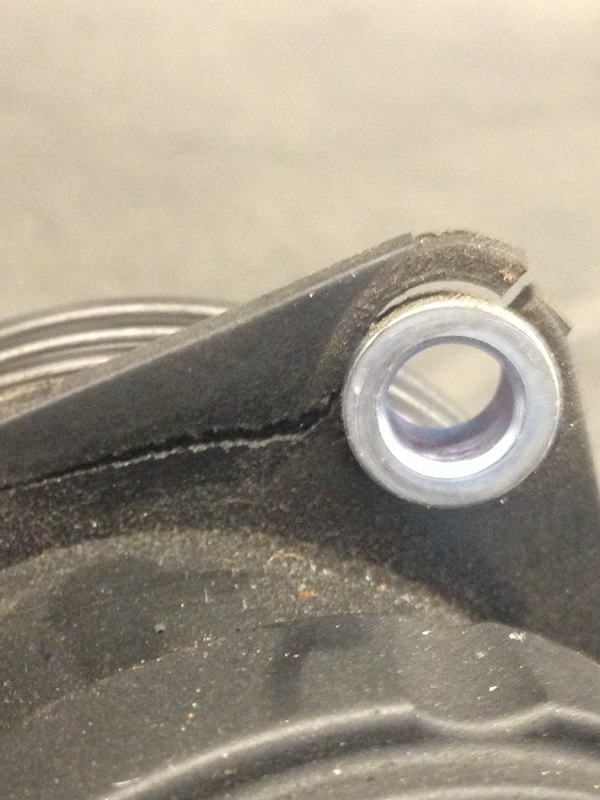 Here what I found once I removed the plastic intake running to the turbo,,,,,,notice how the plastic ear tab is cracked,,,,,,and that one eye hole is where it gets mounted on,,,,,so that whole intake running was loose and causing the intake leak. 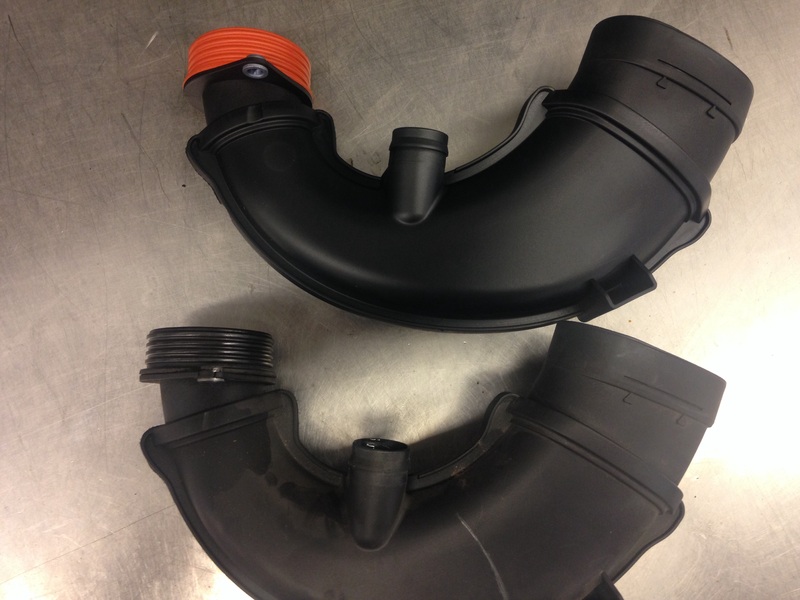 Here is the old one and the new one,,,,the new one is the one with the orange turbo seal at the end,,,,,that’s also one of the new seals we replace during the customer care package. 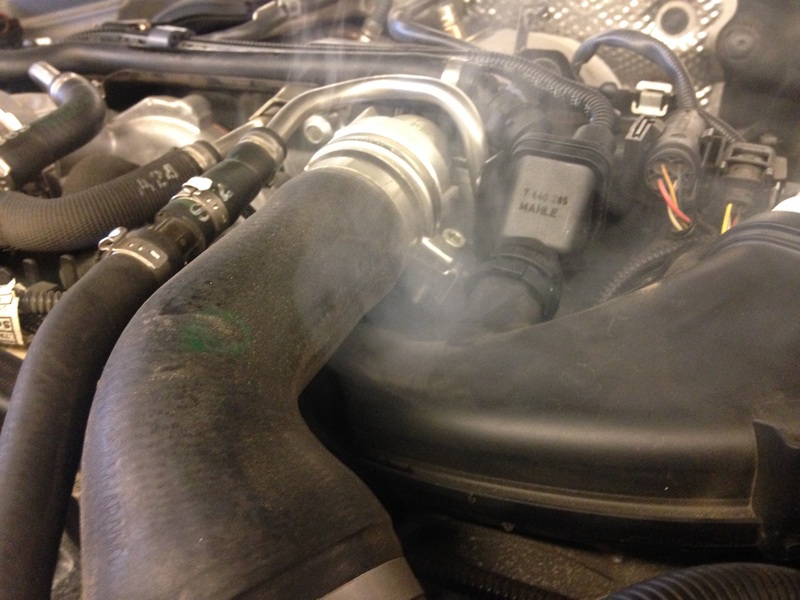 This entry was posted in Uncategorized and tagged intake leak, N63 lean mixture. Bookmark the permalink. as I from Germany we do not have the ccp. My workshop found it because I had a burned oil smell in the car. The reason was the same crack. Some oil (from the charger air) was leaking and was burned on the engine surface. That’s interesting you don’t have the cap in Germany ,,,,,what part of Germany are you from,,,,,I was just there last year. Had you not found the crack and replaced the O2 sensor only, is there a possibility that running the test again would have reported it “fixed”? Munich a very nice place,,,,my wife and I had a very good time in Munich ,,,,we saw the English garden,,,,BMW factory,,,Olympic stadium,,,, that was one of are favorite places to visit,,,,we had a lot of fun and good people. Next time, when you visit us, just drive also to Dingolfing in lower bavaria, It is only one hour from munich and you can see how the bigger models (also M) are produced. No this would not make it hard to start.